So you’re growing nasturtiums and they’re scrambling across every available space in your garden. Even the spaces that weren’t available they’ve made available. They like to grow and they’re not fussy about where. Nasturtium plants have minimal requirements but provide maximum benefits. As well as being a wonderful companion plant in the garden (while they do like to spread, they aren’t invasive and are very easy to remove if need be) they’re also a delightful source of food. The flowers make for a colourful and tasty addition to salads, as do the young leaves. The leaves can also be made into pesto or dried and ground to a powder form to be used as a pepper substitute. And that’s not all. 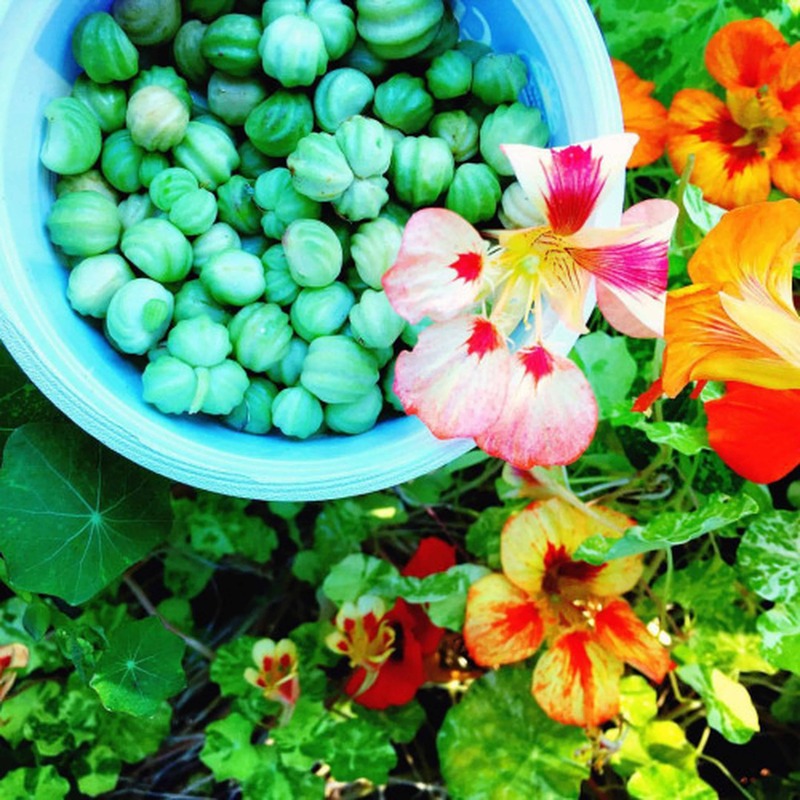 The green seed pods are also edible and can be pickled to create what many people refer to as nasturtium capers. Harvest the seed pods while still green and if they happen to have a slight reddish tinge to them they’re also fine to use. Don’t use any that have started to turn brown for your pickles. Those ones you can set aside to keep for sowing next season. Although nasturtiums are prolific self-sowers, so you may prefer to gift those saved seeds to friends. The following recipe is for one small jar of nasturtium capers. 1. Rinse the nasturtium seeds thoroughly and place them in a jar. 2. 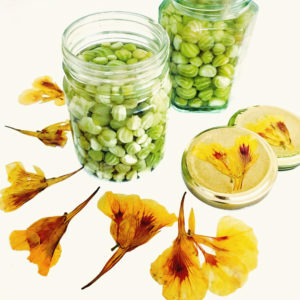 Make a brine solution by dissolving 1 teaspoon of salt in 1 cup of water and pour it over the nasturtium seeds. Place lid on jar and allow it to sit at room temperature for 24 hours. 4. Drain and well rinse the seeds. Place them in a sterilized jar. 5. Bring to boil the vinegar and sugar and pour over the seeds ensuring to completely cover them and then allow to cool (you may wish to add spices and herbs to the vinegar solution such as peppercorns, bay leaves, thyme or whatever takes your fancy). 6. Once sufficiently cooled place lid on jar and refrigerate after opening. They will store in the fridge for at least 6 months. Simply use as you would traditional capers, bearing in mind that they have a punchy flavour so a little goes a long way. Enjoy! 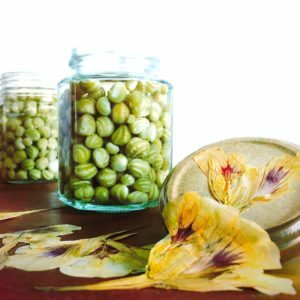 Note: pressed nasturtium flowers can be used to decorate the lids or make labels with to sweeten up those jars for gift giving.